Find information about EndNote features or download the free 30-day trial using the links below. Product details for the latest version of EndNote. Download the free 30-day trial version of EndNote. An overview of features only available in EndNote on the desktop. 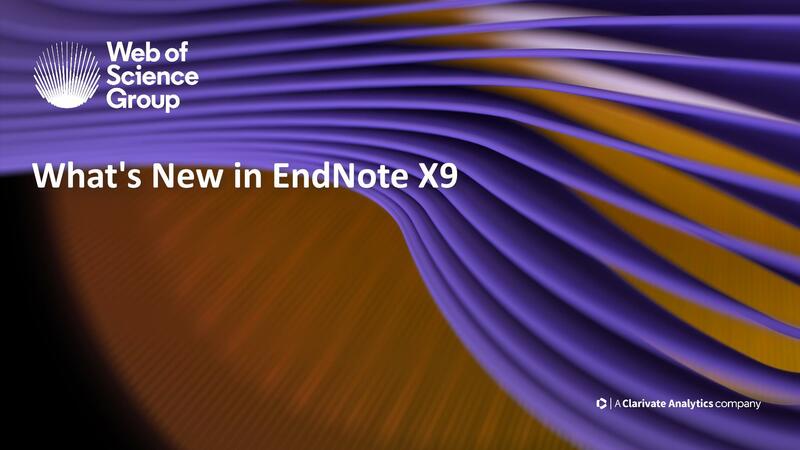 Compare the features of EndNote X7, X8, and X9. Times shown are for the USA Eastern time zone. Open an event and click the link to show the time in your time zone for more information on local times. Download installers for updating EndNote. If your copy of EndNote was provided by your school or employer, you should contact them for the latest installer. Download new or updated EndNote styles. Download new or updated filters for importing from online databases. Filters are used for importing data INTO EndNote; styles are used for data that is being sent from EndNote into word processors, etc. Download new or updated connection files. Connection files are used for searching online databases from within the EndNote program. Most of these databases use the z39.50 Internet protocol. EndNote compliance statement for the Americans with Disabilities Act (ADA). Have a product question? Search our knowledge base or open a support case with our customer case teams. We supply free training copies to qualified university librarians and IT personnel or software trainers at universities, companies, and government agencies. You must be in an official teaching or training position to receive a training copy. Students may not receive training copies.